Brush the smooth sides of the mushrooms with olive oil and then sprinkle them with sea salt and black pepper. Heat a non-stick grill or saute pan on high heat for 4 minutes. Place the mushrooms (smooth side down) in the pan. Sprinkle the stem side with sea salt and black pepper. Cook without touching for 5 minutes. Remove from the heat and let the mushrooms cool. 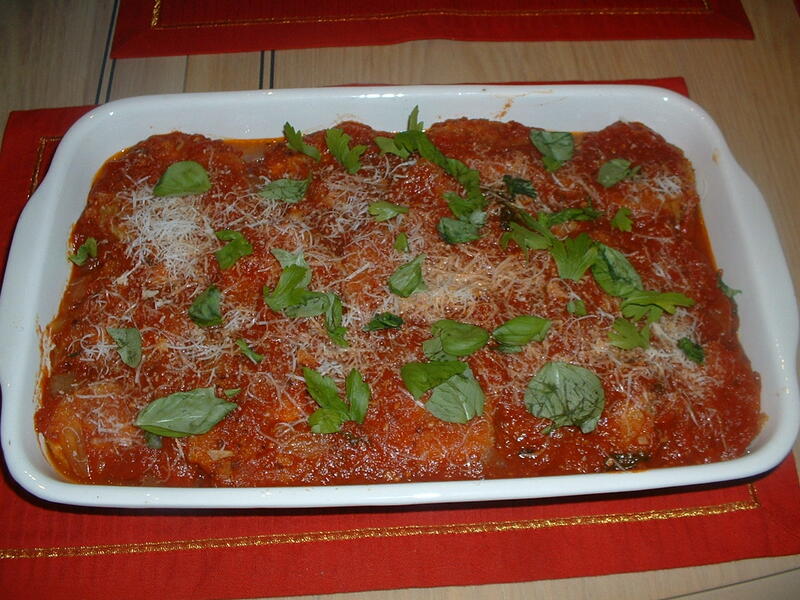 Spread two cups of the marinara sauce evenly on the bottom of a baking dish. Place the mushrooms (smooth side down) on top of the sauce. Spoon an equal amount of the remaining marinara sauce on each of the mushroom tops. Place an equal amount of the grated cheese on each mushroom. Put the slices of mozzarella on each mushroom. Bake in the preheated oven for 1/2 hour until the cheese is bubbly. Put the peeled and cut potatoes into a pot. Add enough cold water to just cover the potatoes. Add a tablespoon of sea salt. Cover the pot and put it on medium heat. Cook the potatoes until they are fork tender (meaning a fork can easily pierce a potato). Drain the potatoes in a colander and put them back into the same pot. Whisk the milk, the yogurt, the parsley, the garlic powder, the black pepper, and a teaspoon of sea salt until well blended. Put the pot of cooked potatoes on low heat for three minutes and let the potatoes steam. This step helps to remove any excess moisture. Add the butter and the milk/yogurt mixture. Mash with a potato masher until the desired consistency is achieved. Note: I like my mashed potatoes a little on the chunky side. Taste and add more sea salt and/or black pepper, if desired. Turn the heat off and cover the pot to keep the potatoes warm until you are ready to serve them. Cook the spaghetti in a pot of salted, boiling water according to the package instructions. Drain the spaghetti well in a colander. Mix the pasta well with the marinara sauce and a 1/4 cup of grated Romano cheese. Set the pasta aside and let it cool for 20 minutes. Whisk the eggs, the whole milk, and a 1/2 cup of grated Romano cheese until well blended. Mix the breadcrumbs with a 1/4 cup of grated Romano cheese. Brush the bundt pan with the two tablespoons of olive oil. Sprinkle the breadcrumb and cheese mixture evenly on the bottom of the pan. Mix the spaghetti and the egg mixture together. Pour the pasta and egg mixture into the bundt pan and spread it out evenly. Spread the top of the spaghetti evenly with a cup of marinara sauce. Bake the pasta pie in the preheated oven for one hour. Let the spaghetti pie cool for 10 minutes. Invert the bundt pan on a flat cutting surface in order to free the pie from the pan. The spaghetti pie should look like a cake. Cut and serve with extra marinara sauce on the side. 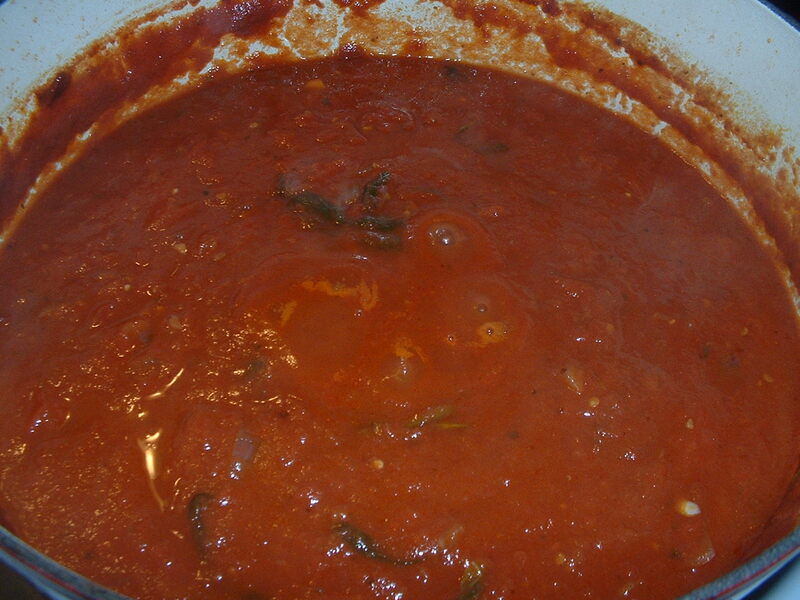 This sauce is the base for many Italian recipes. Into a large sauce pot, add the olive oil, the onion, the garlic, the oregano, the sea salt, the crushed red pepper flakes, and the black pepper. Cook on medium high heat stirring frequently for 4 minutes. Add the red wine. Scrape the bottom of the pot to remove any of the cooked bits of onion and/or garlic that might have accumulated. Let the wine cook for 5 minutes. Add the tomato paste. Stir to incorporate the tomato paste with the wine. Cook for 3 minutes while continuing to stir. Add the hand crushed tomatoes. Stir the mixture well and bring it to a slow boil. After the sauce begins to boil, reduce the heat to low. Tie the basil, the parsley, and the thyme into a bundle with butcher’s twine. Drop the bundle into the pot. Simmer the sauce on low heat for two hours. Remove the herb bundle. Taste and add more sea salt and/or pepper, if needed. Serve with your favorite pasta or the sauce can be kept in the refrigerator for future use. This recipe offers an interesting slant on the traditional chicken and biscuits and is a great way to use up excess pancake mix. Into a large pot, add the chicken breasts, the chicken stock, the whole peppercorns, and two teaspoons of sea salt. Cover the pot and put it on low heat. Bring the stock up to a simmer slowly and then continue to simmer it for 1 1/2 hours. Remove the chicken and let it cool. When cooled, remove the skin and the bones. Cut the cooked chicken meat into about one inch pieces. Drain the the remaining chicken stock through a strainer. Set the chicken stock aside. Wipe the pot clean with a paper towel. Using the same pot, add the butter and the vegetable oil. Cook on medium heat until the butter melts. When the butter melts, add the flour. Whisk the mixture until it is smooth and well blended. Add the onion, the carrots, the celery, the garlic, the mushrooms, the bay leaf, two teaspoons of sea salt, and a teaspoon of ground black pepper. Turn the heat up to medium high. Cook the vegetables for 4 minutes stirring constantly. Add the chicken stock to the pot. Stir the mixture well. The sauce will begin to thicken as the mixture comes to a boil. When the sauce reaches the boiling point, stir it well and reduce the heat to low. Tie the parsley stalks, the thyme stalks, and the rosemary stalk into a bundle with butcher’s twine. Drop the bundle into the pot. Cover the pot. Simmer for one hour stirring occasionally. After one hour, remove the herb bundle. Taste and add more sea salt and/or black pepper, if desired. Add the peas and the chicken. Let the mixture simmer for 5 more minutes and then turn off the heat. Mix the pancake batter according to the package instructions. Add the chopped scallions to the batter. Cook the pancakes according to the package instructions. Serve the chicken, the vegetables, and the sauce on top of the pancakes. Sprinkle both sides of the cod with sea salt and ground black pepper. Into a sauce pan, add the butter, the garlic, the lemon juice, 1/4 teaspoon of sea salt, and 1/4 teaspoon of black pepper. Heat on low heat until the butter melts stirring constantly. Pour the butter mixture on the breadcrumbs and mix until the breadcrumbs are moistened. Spoon the breadcrumb mixture evenly on one side of the fish. 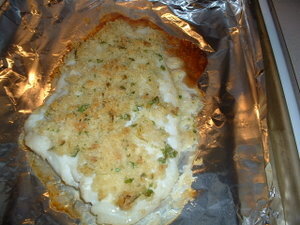 Place the fish (breadcrumb side up) on a baking sheet that has been sprayed with cooking spray. Roast the fish in the preheated oven for about 40 minutes until the breadcrumbs turn light brown. Into a Dutch oven, add the olive oil and chorizo sausage. Cook on low heat until the sausage is crispy. Remove the chorizo sausage and let it drain on a paper towel. Chop the sausage into smaller pieces when it is cool and reserve. Start to make a sofrito (a Latin cooking base) by adding the cilantro, the garlic, the onion, the celery, the jalapeno pepper, and the sea salt to the hot oil. Cook on medium high heat stirring frequently for 5 minutes. Add the lime juice and the tomato paste. Cook while stirring frequently for an additional three minutes. Add the rice and stir so that the rice gets well coated with the sofrito. Add the stock and stir the mixture once. Bring the contents of the pot to a boil. Add the black beans and stir one more time. Cover the pot and place it into the preheated oven. Cook for 45 minutes until the rice is tender. Serve with additional lime wedges and chopped cilantro. Garnish with the crispy chorizo sausage. Crispy chorizo sausage is used instead of the traditional bacon bits for an interesting twist. Cook the chorizo sausage in a saute pan on low heat until crispy. Let the sausage drain on a paper towel and cool. Into a salad bowl, add the apple cider vinegar, the Dijon mustard, the maple syrup, the sea salt, and the black pepper. Whisk until well blended. While whisking, slowly drizzle in the olive oil. Continue to whisk until the dressing is smooth and thickened slightly. Taste and add more sea salt and/or black pepper, if desired. Add the spinach leaves on top of the dressing in the salad bowl. Toss the spinach gently to coat the leaves with the dressing. Serve on salad plates. Garnish the top of each salad with red onion, mushroom slices, egg, and crispy chorizo. Add a teaspoon of olive oil, a minced garlic clove, a tablespoon of Spanish onion, a pinch of sea salt, and a pinch of black pepper to a small saute pan. Cook on medium low heat stirring occasionally for four minutes. Remove the pan from the heat. Into a mixing bowl, add the ground beef, the cooked garlic, the cooked onion, the chopped parsley, the breadcrumbs, the egg, the warm water, a teaspoon of sea salt, and a 1/2 teaspoon of ground black pepper. Mix well with your hands until all of the ingredients are well incorporated. Form the mixture into meatballs (about the size of golf balls). Roll the meatballs in the flour to lightly coat them. Into a Dutch oven, add two tablespoons of olive oil. Put the Dutch oven on medium high heat for four minutes. Add the meatballs and saute them for five minutes until the meatballs on brown on all sides. Remove the meatballs to a plate. Remove all but one tablespoon of the grease that has been rendered. Put the pot back on medium high heat. Add about a cup of the carrots, a cup of the Spanish onions, two minced garlic cloves, the celery, two teaspoons of sea salt, and a teaspoon of black pepper. Cook for four minutes while scraping the bottom of pot to loosen the brown bits that have accumulated. Add the red wine and cook for six minutes. Continue to scrape the bottom of the Dutch oven until all of the brown bits have been lifted. Add the tomato paste and stir to incorporate the paste into the red wine. Add the mushrooms and stir again. Add the meatballs back into the pot along with the chicken stock. Bring the mixture to a boil. After it begins to boil, turn the heat down to low. Tie the parsley stalks, the thyme stalks, and the rosemary stalk into a bundle with butcher’s twine. Drop the herb bundle into the pot. Add the bay leaf to the pot. Simmer with the lid 3/4 of the way on for 1 and 1/2 hours. After 1 and 1/2 hours, remove the herb bundle. Skim off any of the excess grease that accumulates on the surface. Taste and add more sea salt and ground black pepper, as needed. Add the rest of the carrots, the green beans, and the potatoes to the pot. Cover the Dutch oven all the way and simmer for another 1 and 1/2 hours. The stew is done when the potatoes and carrots are tender when pierced with a fork (fork tender). Turn off the heat. Taste and add more sea salt and ground black pepper, as needed. Serve on top of buttered noodles. Serve with a side of pasta for a complete meal. In a shallow baking dish, mix the beaten eggs with two tablespoons of water. Sprinkle with salt and pepper. Put the flour on a baking sheet. Sprinkle with salt and pepper. Put the bread crumbs on a baking sheet. Sprinkle with salt and pepper. Heat about a 1/4 inch of olive oil in a 12-14 inch non-stick skillet on medium high heat. Note: you will know that the olive oil is hot enough to fry in when you see ripples in the olive oil and it smokes slightly. Dip the eggplant slices one at a time into the flour. Lightly coat each slice. Secondly, dip the eggplant slices one at a time into the egg mixture. Thirdly, put the eggplant slices into the bread crumbs. Dredge the eggplant slices in the bread crumbs coating them evenly on all sides. Fry the eggplant slices in batches in the hot olive oil, turning once, until they are golden brown. Note: do not fry more than five eggplant slices simultaneously as this will lower the temperature of the olive oil. Transfer the cooked eggplant slices with a fish spatula to a paper towel lined plate to drain. 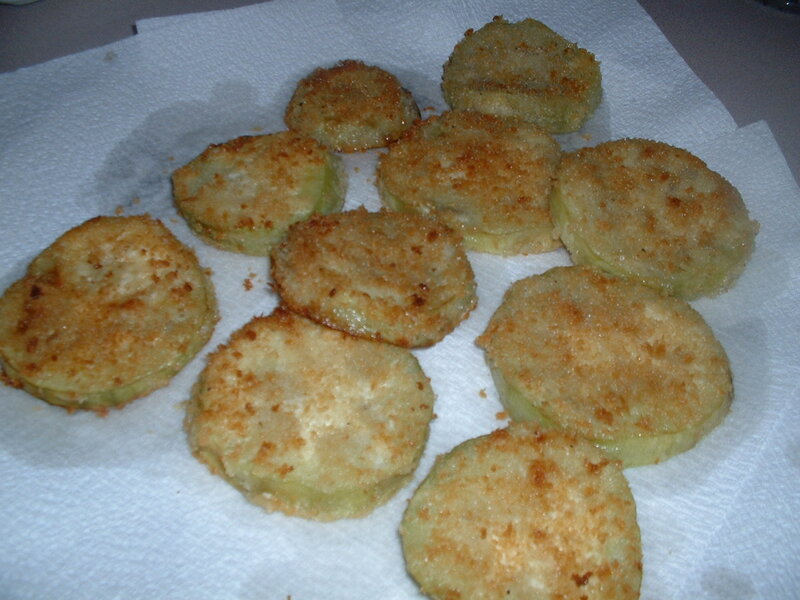 Sprinkle the fried eggplant slices with salt and pepper while hot. Note: more olive oil will need to be added to the skillet (in between batches) during the cooking process because the eggplant will absorb some of the oil. 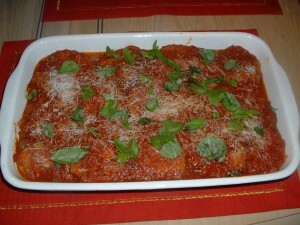 Coat the bottom of a casserole dish evenly with two cups of the marinara sauce. 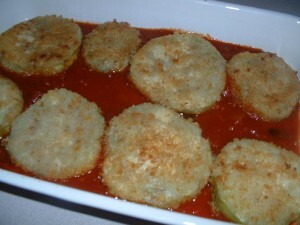 Arrange half of the fried eggplant slices on top of the sauce in a single layer. Add two teaspoons of the marinara sauce to each slice and smooth it out with a spoon. 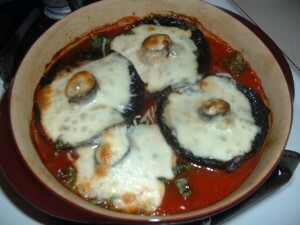 Add the shredded mozzarella cheese on top of the eggplant giving each slice an equal amount. Add the rest of the fried eggplant slices on top of the cheese layer. Add the rest of the marinara sauce to the second layer of eggplant spreading the sauce evenly to coat each slice. Sprinkle the Parmesan cheese over the top of the sauce. Note: you can add more mozzarella or Parmesan cheese, if desired. Cover the casserole with aluminum foil. Bake in a preheated oven at 350 degress for one hour.